We would all like to finish our home with pieces of original art but the price tag can certainly be a deterrent. There are most likely local artists producing work in your area, but finding them and their work can be difficult. I have some alternative options to help you produce your own art (with a bit of professional help in some instances) for your home. The prices of digital cameras are falling and cameras which take excellent photos are now more readily available on the high street to the amateur photographer. We all take photos which we are extremely proud of and are keen to show off to our families and friends after we have taken them but then they end up sitting in a file on a computer hard drive or in an album and will rarely be looked at again. Whether it is a beautiful portrait of family members, a stunning sunrise over a river or even an abstract close up of a frost-tinted spider web, we all feel a great sense of pride at these photos and we need to remember that we can use these photographs to create art for our own home which is equal to that of professional artists. Take pride in your photographs and think about having some of them printed out in a larger size, not your typical 6x4”, and get your picture framed. Frames can be picked up very cheaply at jumble sales, DIY shops and even pound shops. They don’t need to be ornate gilt frames, remember your photo is meant to be the talking point. If you are feeling extra creative it doesn’t have to be a single photo, what about a collage of holiday photos or landscape photos from across the seasons. If you are looking for something to brighten up a tired looking dormitory room at university you could get a set of pictures of all your friends and family back home and create a collage across one wall or above your desk. We do not all have a natural talent for the arts but if you are a talented artist then consider framing some of your own pictures and decorating your home. You never know your guests may be so impressed that you could be commissioned to produce art for your friends. Whether it is a watercolour, a collage or even some pottery or a sculpture you can add a great feature to any home with your own art. If you are not feeling too confident in your abilities you could even join a night class and then show off the results of your course in your home. Another way to create beautiful art for your home is to print your photos on canvas. These canvas printing services take your digital image and blow it up to a size of your choice and print onto a canvas. 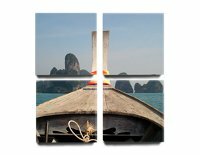 You can even choose the style of canvas print – portrait, landscape, triptych (three panels) and four panels. There are also a number of options beyond a simple print, try splitting your landscape picture into a triptych print, which splits the panels into three, which are then hung side-by-side for a unique and professional-looking effect. You can also choose to have a number of effects applied to the digital image you took, so that portrait you took of your partner could be printed in black and white and you could use a colour splash canvas to print out your wedding photo to great results. There are some great options available to help you produce some great affordable art for your home, and imagine the pride you will feel as you explain to a guest that the art they are admiring is a photograph you have taken, it just takes a bit of the DIY spirit!